This Contextual (or "CTX", for short) Image, taken by the NASA - Mars Reconnaissance Orbiter on December, 2, 2014, shows us a new (---> VERY fresh) and relatively small (in fact: EXTREMELY small!) Impact Crater located in the Martian Volcanic Region known as in Elysium Planitia. This new Impact Feature, which was first discovered by the Mars Context Camera ("CTX", also located onboard the NASA - Mars Reconnaissance Orbiter), formed, most likely, between the month of February of the AD 2012 and the month of June 2014. The Impact Event appears here as a very Dark Streak, with multiple Secondary Craters, which was/were not seen in any previous CTX image of this specific area. 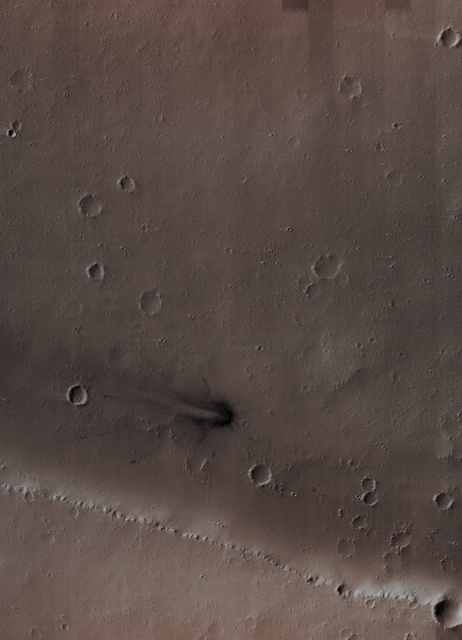 The HiRISE Camera commonly monitors new Impacts on Mars, such as this one; however, this is the first CTX image of this particular Impact Crater ever shown by HiRISE. The image also shows us a very distinct (---> peculiarly looking) Crater Rim and Ejecta Blanket that is much darker than the surrounding Dust-covered Terrain. Last, but not least, the distribution of the Rayed Ejecta suggests that the Impactor struck the Surface of Elysium Planitia at a high angle, while coming from the West. Coord. (centered): 18,012� North Lat. and 138,662� East Long. This picture (which is a NASA - Original Mars Reconnaissance Orbiter b/w and NON-Map-Projected frame identified by the serial n. ESP_039148_1980) has been additionally processed, reduced in size to fit the page, contrast enhanced, Gamma corrected, and then colorized in Absolute Natural Colors (such as the colors that a human eye would actually perceive if someone were onboard the NASA - Mars Reconnaissance Orbiter and then looked down, towards the Surface of Mars), by using an original technique created - and, in time, dramatically improved - by the Lunar Explorer Italia Team.